La note a été taggée Bluetooth, English, Mac OS X, PlayStation 3, SIXAXIS. You own one of the few Mac games but you do not have a joystick ? Good news , a single Playstation 3 SIXAXIS works perfectly on a Mac, without any third party software. Tip : You can also do it with USB (in french) and it’s easier . Before you begin, it is better to reset the controller by pressing the button on its back with a paper clip and turn off the PlayStation 3. Under Lion and Mountain Lion, the method seems a little “magic” , but it has the advantage of operating in any case if you follow the steps well , I ‘ve tested it on two machines running under Lion and Mountain Lion. – Plug the controller on USB to the Mac. – Check that the Bluetooth is in discovery mode. – Press the PS button on the controller during 3 seconds ( the red buttons flash). – The controller requires a password , then enter 0000. – Add the joystick to Bluetooth favorites by clicking on the toothed wheel in the Bluetooth preferences. – It disables the Mac Bluetooth. – Connect the controller on USB . – Press the PS button on the controller for 3 seconds. – Able the Bluetooth again. Now , the controller should keep the connection active at all times. For those who want to, here is an online video to show exactly how to do it. – Plug the controller on USB to Mac (PlayStation 3 off). – Check that the Bluetooth is on discovery mode . For those who want to, Feral offers a video. To use it, beware: Mac OS X does not offer preference boards for joysticks, but it works anyway. Just take a game that supports joysticks to realize it. To best way to test the controller is Joystick And Gamepad Tester 4.2. This little program allows you to test a controller very easily. 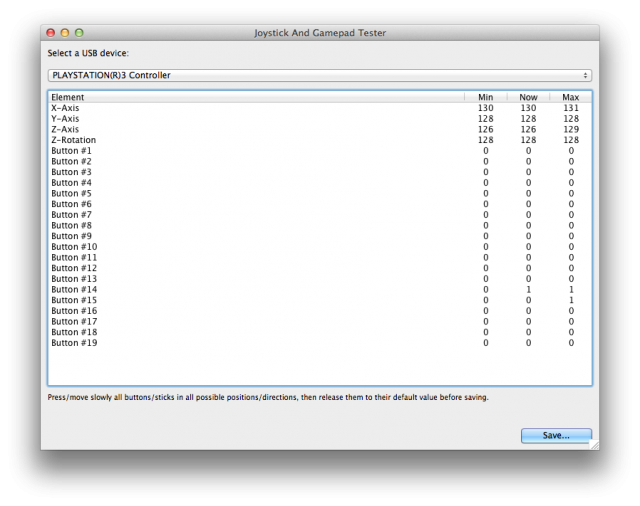 All games that use the Mac OS X API for joysticks should bear the PS3 one. Tip : whether the controller asks you to enter a numerical code, keyboard style : your controller is a counterfeit . It sometimes happens on cheaper models.